WITH A WIDER KEYBOARD, A WIDER RANGE OF REPERTOIRE IS POSSIBLE: With the wide, 76-note, touch-sensitive keyboard at your fingertips, more complex piano pieces can be mastered with maximum dynamic expression. 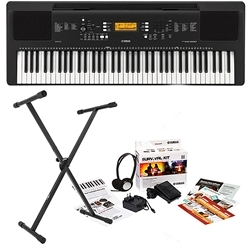 TOUCH-SENSITIVE KEYS ALLOW EXPRESSIVE DYNAMIC CONTROL: Play the keys heavily and you'll get louder tones, or play softly to achieve quieter sounds. The touch-sensitive keyboard will accurately reflect every nuance of your playing, making your performances musically expressive.